In the last few posts have been mentioning about how LIC has been systematically been investing in some of the midcap companies which have no credentials and have led to huge losses. In a little older post have mentioned about how LIC had bought into Giitanjali Gems and Core Education before the big drop. Now will be posting about some of LIC investments one buy one. The company came out with an IPO at 150 rs which according to Crisil was graded as 2/5. After dropping to 77-80 after the IPO the stock saw a rally to a high of 820 rupees. The stock is now avaliable at 5 rs. 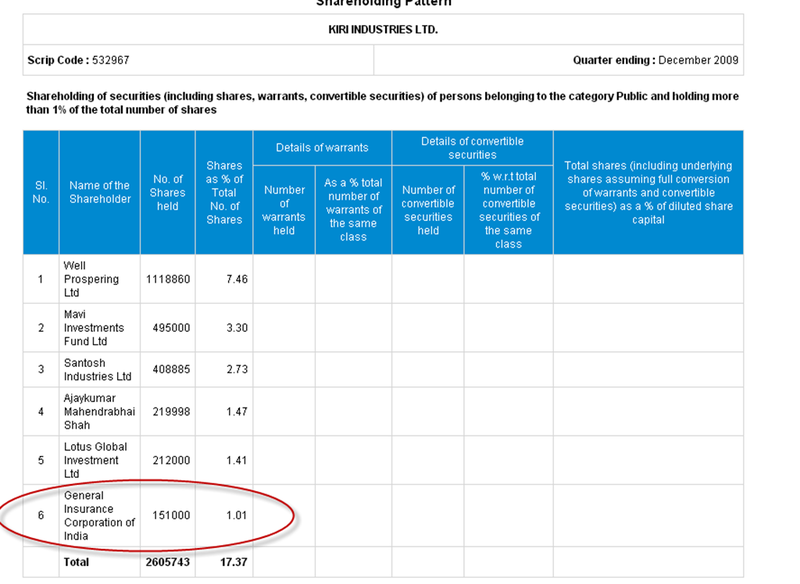 Lets look at how LIC and even GIC,IFCI took stake in such a company with low credentials at higher levels. In December 2009 shareholding – GIC was the first institutional investor to buy a 1% stake in the company. Then comes the big quarter of dumping to institutional investors – IFCI, GMO Emerging Market Fund, DSP Blackrock Midcap Fund, Sundaram Mutual Fund. 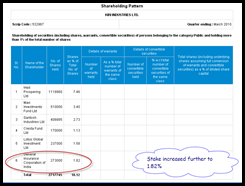 The promoter stake got reduced to 58% from 73% . Lot of market-men were also supposed to be part of the deal. 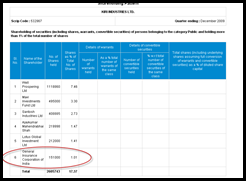 This was the QIP issue brought by sole banker – First Global – aka Shankar Sharmas company at 597 rs. 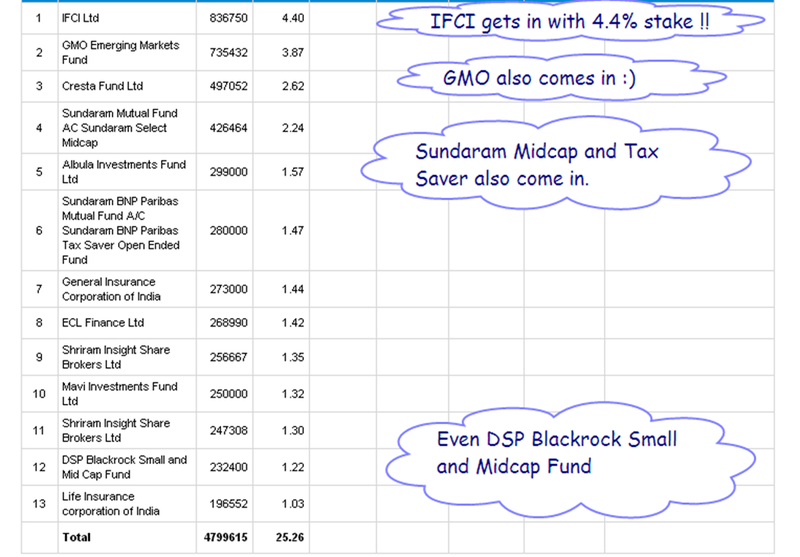 In the next 2 quarters DSP Blackrock was the first to exit with small losses and then Sundaram Midcap also got out. Finally even GMO and promoters sold. The only ones holding the stake are now IFCI, LIC and GIC. Promoters have reduced stake to 27% and all the Cresta Fund, Mavi Investment fund , Well Prospering Limited and other operator circles are out. This is the chart of the stock and the way it was propped up and placed to Institutional Investors. 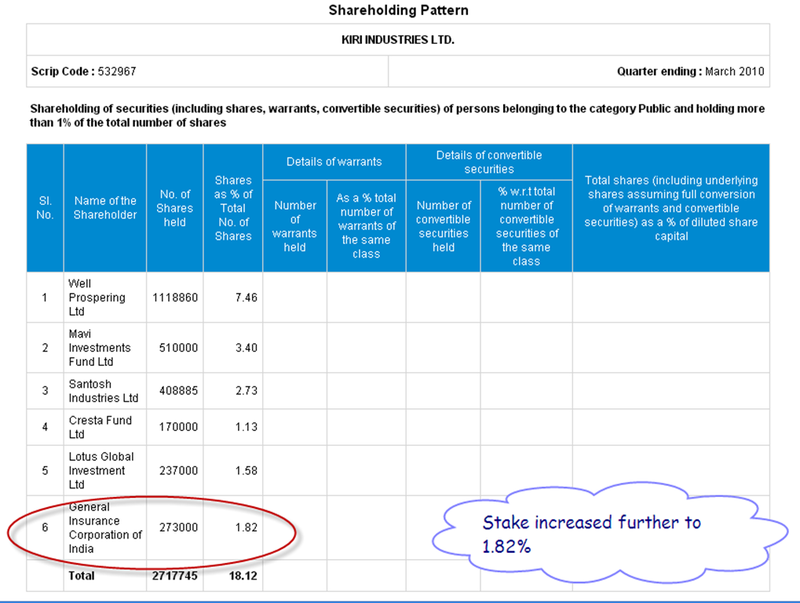 In absolute terms the investment is very small for LIC, GIC and IFCI because a 2 lakh shares is just 10 crores. LIC invests around 40k crore + every year so these investments seem to be small. 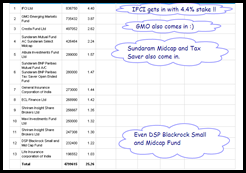 Even the portfolio values of IFCI and GIC are very huge. Supposedly such deals are favorable for fund managers who get a cut on execution. But if one has to look in the same way if such small numbers add up to 20-50 such stocks and larger sizes will become a very big number in a few thousand crores. For example LIC bought a stake in Welspun from operators like Sanjay Dangi who later came under probe for a value of 268 crores in 2010 is now worth less than 50-60 crores after 3-4 years of investment. The recent Gitanjali number also seems to be same. Me would putting more such detailed posts on more such scam investments of LIC, GIC and other fund companies if possible in coming few days. Lets hope there is more activism and probe on the same. I have been tweeting about this scam for past few days. P. S : One of my family member is a LIC agent and i also had belief in the investment process of LIC it makes me angry to see so many of such scam investments. Am not even talking about the PSU investments. As a market analyst it is not advisable to write such posts but will hope for the best.